Do we ever stop and ask the question, why do we do what we do? Could it be that we are going about it the wrong way and there's a better way – a slower more thoughtful way to achieving a fulfilled life? Well, this is what we've been exploring ourselves over the past few years and I had the chance at PechaKucha Manchester Vol. 20 to share my insights on how slowing down could get us where we want faster. 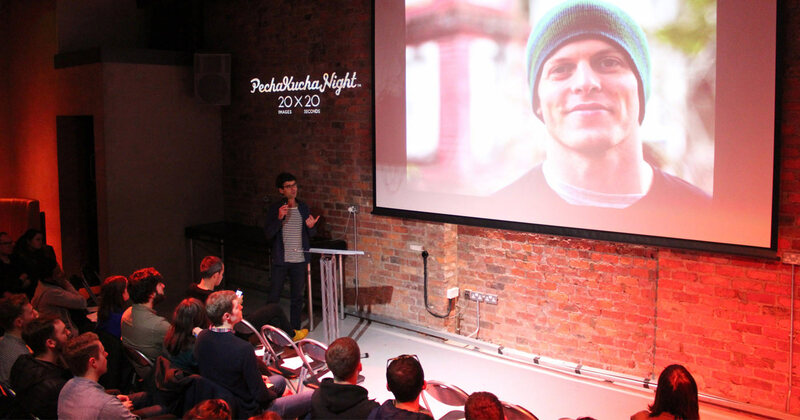 PechaKucha brings together people who want to inspire and be inspired. At each event, a host of speakers take up the challenge to present on the topics that mean the most to them by following the 20x20 rule: they only have 20 images and 20 seconds per slide, with no stopping! The format of the event has become so popular that's it's happening in over 1000 cities around the world. I can see why too, as the short format to the night works a treat, with only 6 minutes and 40 seconds for each talk it keeps the speakers on their toes, as well as preventing them from waffling on for ages. And it also works perfectly for the audience, allowing them to receive bite-size bits of info without having their attention drifting off (which often happens at longer events). I was fortunate enough to get out there and do quite a few talks last year, mainly at universities with students talking about our work and design process. However, this was the first time I had spoken so openly about our new working approach, and with it being close to our old home in Salford, it felt a bit strange coming back to see familiar faces. My talk is now online for those who fancy a listen (let us know what you think of it over on our Twitter or Instagram). And I was in great company on the night too, Ian Anderson from the Designers Republic took to the stage, as did Jade Hanley from the BBC along with plenty of other inspiring speakers. I have to give a special mention to Viv Slack who in my mind gave the most inspiring talk of the night. Viv co-founded Street Support Network, which supports people who are homeless in a number of major cities in the UK. Their mission is simple - to make it easier for people who are homeless to get the help they need. Listening to her talk really hit home and it's so inspiring to hear these stories of people making a real difference. Also, I've got to give a mention to Kyle and the rest of the team at PechaKucha, between them all they create a really well-polished event, including Fiona Finchett for the photo. As a final note, we are keen to get out there more in the coming months to share more of what we've been up to and how we work, so if you hear of any other opportunities then please drop us an email.